Brendan Pattengale started out wanting to be a commercial fashion photographer, but the draw of nature was too powerful to resist. Every summer he’d join his parents, avid backpackers, in the Eastern Sierra backcountry, and he has hiked with a brother from Bishop to Mt. Whitney. But it was a trip to Georgia O’Keeffe’s Ghost Ranch in New Mexico four years ago that reinvigorated Pattengale’s passion for landscapes. 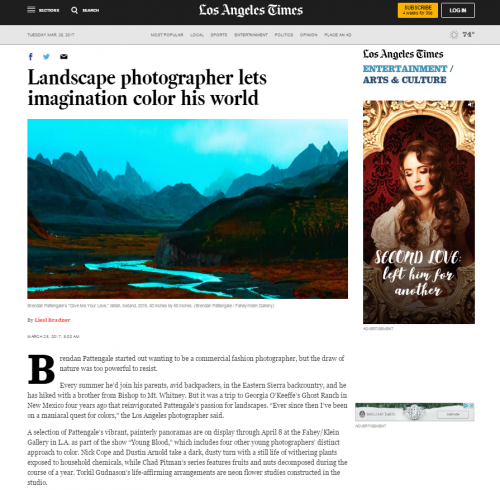 “Ever since then I’ve been on a maniacal quest for colors,” the Los Angeles photographer said. A selection of Pattengale’s vibrant, painterly panoramas are on display through April 8 at the Fahey/Klein Gallery in L.A. as part of the show “Young Blood,” which includes four other young photographers’ distinct approach to color. Nick Cope and Dustin Arnold take a dark, dusty turn with a still life of withering plants exposed to household chemicals, while Chad Pitman’s series features fruits and nuts decomposed during the course of a year. Torkil Gudnason’s life-affirming arrangements are neon flower studies constructed in the studio. Pattengale travels to Northern Chile, Bolivia, Iceland and other far-off locales where he watches the sun set, the moon rise and the landscape react to the light in the hours in between. “I wait to see what the Earth and atmosphere reveals in regards to color,” he said, adding that his bag of tricks includes a stash of sunglasses with different-colored lenses.